In the MINI world, three words mark the top level performance trim: John Cooper Works (or JCW for short). But what makes a JCW? In the 1960’s, John Cooper’s workshop became famous for building race cars. The most notable one being the Austin MINI Cooper S that went on to win the Monte Carlo Rally in 1964, 1965, 1967 and would have swept 1966 but were disqualified on a technicality (headlights). As his workshop made motorsport history, we now have our very own John Cooper Works collection fit for every MINI. What models are available with a JCW upgrade? 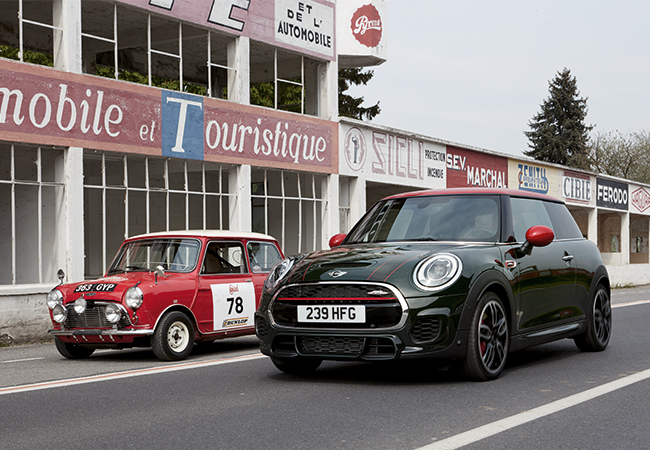 MINI’s motorsport legacy lives on in the high-performance MINI John Cooper Works range, which includes the 3 Door, Convertible, Clubman and Countryman. Every model in this lineup is equipped with racing-grade tuning and upgraded parts to make a powerful impression. The MINI JCW vehicles can be spotted by their three signature features: exterior mirror caps, exclusive interior, and distinctive front end. Performance wise, the JCW variants are equipped with upgraded transmissions, oversized brakes, sport suspensions, and a suite of top-of-the-line hardware. JCW Pro Parts & Accessories. Whichever route you choose for your MINI, you’ll be sure to experience its nimble handling and pulse-pumping power! Learn more about John Cooper Works models. Explore JCW Pro Parts & Accessories.